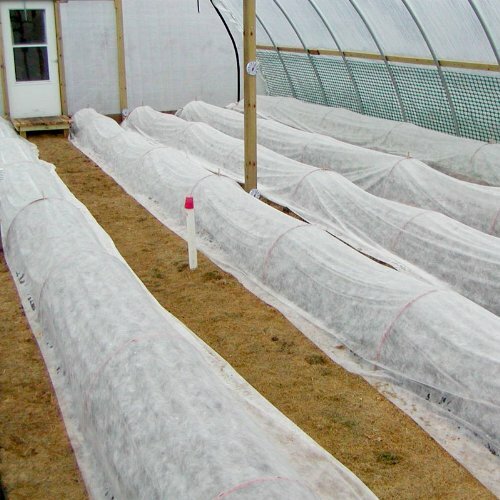 Provide up to 4 degrees of frost protection and increase yields with low-maintenance FrostGuard Row Covers. • Get a head start on the growing season by providing a more suitable microclimate environment for sensitive seedlings. • Also ideal for overwintering container stock, and protecting plants from insects and other pests. • Manufactured from 100% polypropylene, spunbonded with UV stabilizers for long-lasting use. • Seams are sealed with UV-stabilized, hot-melt glue for strength and durability. • Choose the degree of light filtration and frost protection for your crops and climate.